The Perfect Design For The Best Price. Fabulous, Gorgeous Art You'll Both Love! We Personalize the Text for You! 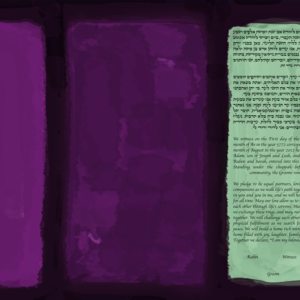 Fabulous Ketubahs From Amazing Ketubah Artists! Shabbat has long been a sacred day for rest and reflection with loved ones. Just like the Havdalah prayer said on Shabbat, a sunset is a magnificent illustration of ending the day and ushering on a new one. With the cool blues and striking orange and pink, we can't imagine a better person to share this sacred moment with than the love of your life. 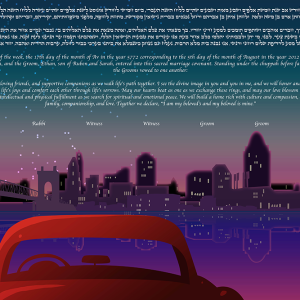 The Havdalah Sunset Ketubah is not just for the couple that appreciates the tranquility of a sunset or time of contemplation. 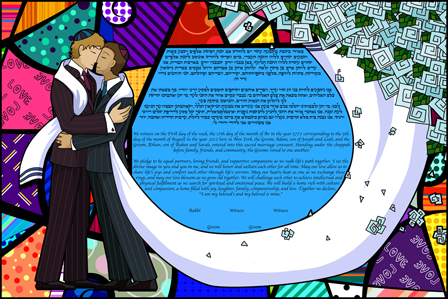 This Ketubah is also for the couple that enjoys celebrating life and love, and of course… a whole day just to relax! Using simple lines and vibrant shades, The CMYK Blend Ketubah isn't afraid of a little color! This design contains a simple floral print, layered to create depth and a dynamic feel to this work of art. 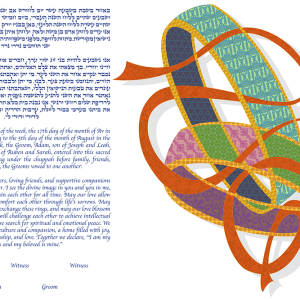 The white lines around the Ketubah text breaks up the mix of vibrant colors to bring shape and a sleek modern feel. This Ketubah is perfect for the couple that are passionate about the more lively and fun things in life! Living life to the absolute fullest, this design will look absolutely stunning in any room of the house. 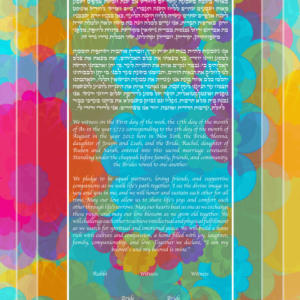 The CMYK Ketubah will beautifully represent the adventure and vibrancy of your lives! A stunning blend of tradition and style, the Entwined Rings Ketubah is the perfect design to honor both your unique love and the classic Ketubah tradition! 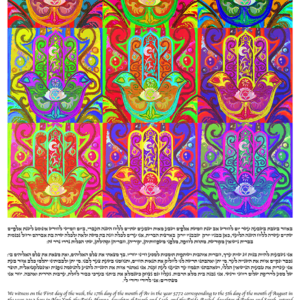 This Ketubah features two entwined wedding rings — each containing a gold framing, vibrant patterns, and tons of color. 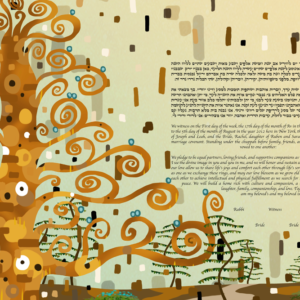 The soft white background brings central focus on the colors and patterns of the design and balances perfectly with the Ketubah text. The Entwined Rings Ketubah is perfect for the couple that wants something classic and traditional, without compromising on the high-quality of modern style and design. The two entwined wedding rings will perfectly represent the union of two lives coming into one. This design will beautifully convey the happiness of your wedding day, the strength of your love, and the sanctity of tradition. 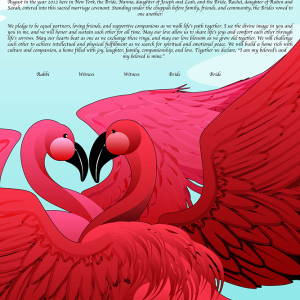 The Flamingos In Love Ketubah is bursting with color, life and romance — the perfect elements to any stunning Ketubah! As one of the prettiest and most social birds in wildlife, flamingos make for a gorgeous theme to represent partnership and connection. This design features two vibrant pink flamingos against a clear blue sky with the text right above — a beautiful blend of both text and design. If flamingos could talk, we imagine that they would have to be a little bit more on the goofier side — which makes this Ketubah perfect for the couple that considers themselves equally as goofy. Whether you simply just love the tropical style or are an animal lover at heart, the Flamingos In Love Ketubah will be a beautiful symbol of your love and relationship! New York is the City of Cities — and the City of Jews. It gives Tel Aviv and Jerusalem a run for their money. New York, the birthplace of so much contemporary secular and religious Jewish culture, from Jerry Seinfeld to the Lubavitch Rebbe, is at the very heart of the contemporary Jewish experience. And the subway is at the Heart of New York. 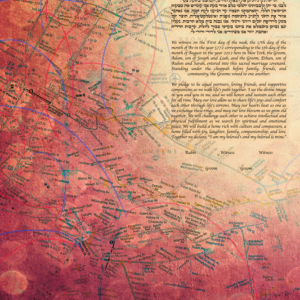 The New York Map Ketubah is thus perfect for the Jew who could never envision himself living anywhere other than the Upper West Side — or perhaps who once thought that, until he moved to Long Island. There’s something especially unique about experiencing the beauty of nature with the love of your life. This work of art is part of our gorgeous Landscape Memory Ketubot Series. 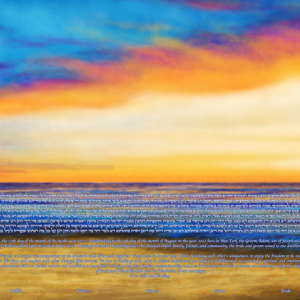 With blending colors and soft hues, this Ketubah is a snapshot into a special memory you share, wether it’s a favorite trip you took together, your honeymoon, or the place where you both go to just watch the sunset. It couldn’t prove that age old adage to be more true — happiness is only real when shared. The Quiet Blues Ketubah shows beautiful tones blending together to create almost a dreamy esthetic. The soft flow and movement of this design lights up the text without taking away from the beauty of the artwork itself. This Ketubah exhibits a sea line with dark blue and green tones and brilliant white clouds, perfect for the couple that wants a palette of deep, rich tones. This work of art will be completely significant to you and your partner — a beautiful memory that holds both your experiences and love. swirls frame a springtime landscape bursting with the life and vitality of newlyweds! 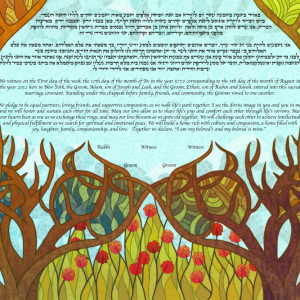 Inspired by the work of Gustav Kilmt, this Ketubah will resonant with those for a taste for bright color and Art Noveau aesthetic. 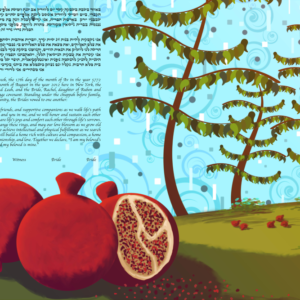 The Pomegranate and Sky Ketubah depicts trees and pomegranates, which are among the Seven Species (Shivat Haminim) of Jewish tradition. Both images are prominent as symbols of life, fertility, and the people of Israel. The airy feel of this Ketubah is complimented by passionate red hues—perfectly capturing the emotion of those who sign it! 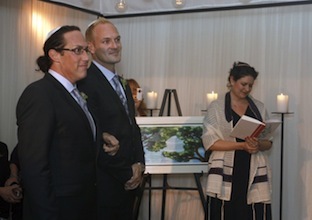 Over 500+ Couples Have Seen Their Ketubah...And Jumped With Joy! 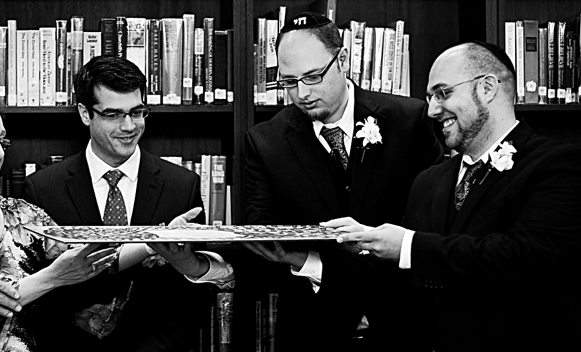 "We LOVE LOVE LOVE our Ketubah!!" "The guys and gals at BagelKetubahs were amazing to work with. 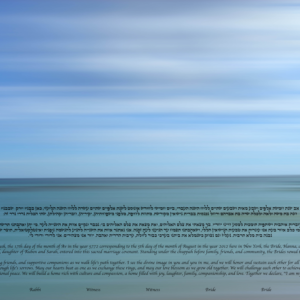 Super speedy, answered all of our questions, and created an awesome Ketubah just for us!!! We love it!!"